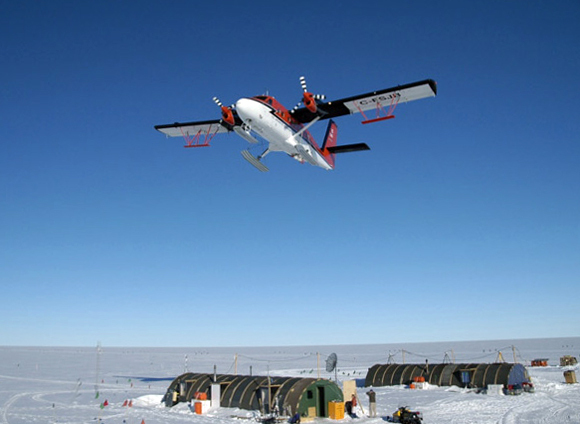 Photo Courtesy: Don Blankenship/UTIG A ski-equipped Twin Otter flies over a field camp in West Antarctica during an aerogeophysical survey of two fast-moving glaciers during the 2004-05 field season. ICECAP scientists have outfitted a larger aircraft with similar instruments to survey a vast area of East Antarctica beginning this season. If the global climate change story has a lead protagonist south of the Equator, it’s West Antarctica, a marine-based ice sheet discharging ice into the ocean about as fast as Greenland is in the Arctic. Scientists generally consider East Antarctica, a much larger and thicker ice sheet, still a minor character in the worldwide warming scenario. But there are signs that even this behemoth may be responding to changing climate — and parts of the ice sheet may be more sensitive than first believed. Researchers from the United States, United Kingdom and Australia have teamed up to explore one of the last relatively uncharted areas of East Antarctica, an expanse that may prove to be the soft underbelly of the ice sheet, the chink in the armor. In this region, roughly the size of Mexico, two huge subglacial basins sit well below sea level, like most of the West Antarctic Ice Sheet. “That’s probably been the area that’s controlled the evolution of East Antarctica, the fast changes over East Antarctica, over the last 10 million years,” said Don Blankenship , a research scientist at the Jackson School’s Institute for Geophysics at the University of Texas at Austin (UTIG) . Blankenship is also the principal investigator on the project, an International Polar Year initiative dubbed ICECAP, for Investigating the Cryospheric Evolution of the Central Antarctic Plate . Beginning in January 2009, the ICECAP team will use an upgraded World War II-era DC-3 aircraft with a suite of geophysical instruments to measure the thickness of the ice sheet and the texture, composition, density and topography of the bedrock below the ice. 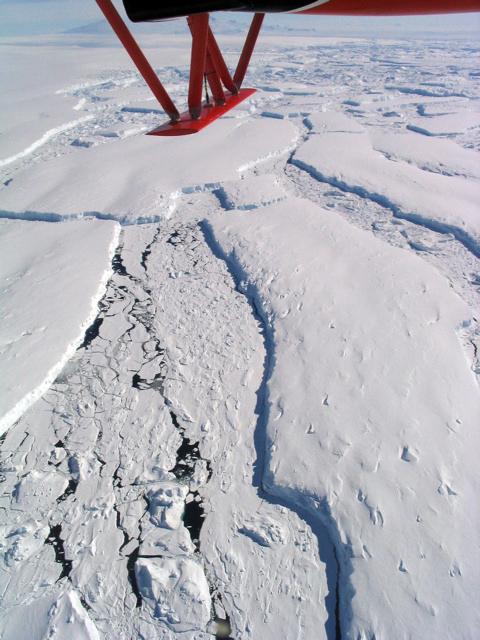 “The large basins of East Antarctica — Wilkes Basin, Aurora Basin, the Adventure Trench and the Astrolabe Basin — are all well below sea level and are all connected to the coastline and each other by channels that are continuously below sea level,” explained Andrew Wright , post-doctoral researcher on the ICECAP project from the University of Edinburgh in the UK . A radar antenna below the plane's wing will pick up radar signals, collecting data about the ice sheet and bedrock below. “Some of the biggest glaciers in Antarctica … each of which is associated with one of the deep East Antarctic basins, have recently been showing signs of surface lowering similar to those observed on the big glaciers in West Antarctica,” he added. ICECAP will focus its work on the Wilkes and Aurora basins. Why is it a problem if that ice sits below sea level? Increases in atmospheric temperatures alone can’t melt these blocks of ice. The ocean plays a key role as warm water flows up under ice shelves and melts them from below. This speeds the flow of the ice sheet, which is grounded to the bedrock, into the water. Scientists estimate the West Antarctic Ice Sheet could raise sea levels about six meters if wholesale melting and breakup occurred. All the ice in East Antarctica could push sea levels by more than tenfold of that estimate were it all to disintegrate, though much of it is above sea level. Still, the ice in the low-lying area targeted by ICECAP is at least a couple of kilometers thick. Blankenship and colleagues in Texas have been winging their way above Antarctica’s frozen wastes for nearly 20 years doing aerogeophysical surveys of the ice sheets and the rock below. In collaboration with colleagues like Martin Siegert , a glaciologist and ICECAP principal investigator who heads the School of GeoSciences at the University of Edinburgh , Blankenship has mapped out the West Antarctic Ice Sheet using a suite of geophysical instruments. But he, Siegert and others are also interested in the subglacial lakes that run below East Antarctica like a municipal waterworks. Lake Vostok is the most famous of the subglacial reservoirs, but there are dozens of these bodies of water,which don’t freeze because of the enormous pressures of the ice above them. A recent study published online in the journal Nature Geoscience used satellite data that revealed a complex network of subglacial plumbing in which water periodically cascades from one lake to another. Water acts as a lubricant, reducing friction at the base of the ice and making the ice flow faster. Blankenship said it is important for the science community to learn more about East Antarctica’s hydrological system and to map out the boundaries between ice and rock. That will help the researchers understand the ice sheet’s evolution and what role the lakes play in its formation and dynamics. “The big problem is that very little was known about the boundary conditions in East Antarctica,” Blankenship said. “There are a few places that have been covered pretty well, but the majority of the place is unexplored.” Some work took place in the 1970s, but little has transpired since then. Blankenship and Jack Holt , also with UTIG, worked with the British Antarctic Survey (BAS) in 2004-5 to explore what Blankenship called the last piece of unknown West Antarctica, the Amundsen Sea Embayment . Using airplanes with radar antennas strapped under the wings, the scientist created detailed topographic maps of the rocks and sediment that form the bed on which the ice sits. UTIG’s aerogeophysical work, he explained, provides a sort of roadmap that other researchers use for more detailed studies of process like the ice-ocean interaction. “That will be going on for years and years, trying to understand the Thwaites and Pine Island glaciers, in particular, in West Antarctica,” Blankenship said.